Sometimes I think of my creative process like a child holding a crayon, drawing constant circular squiggles on a page. Sometimes the squiggle line is focused in small circles, working through a particular area until it's filled with waxy colour. Sometimes the squiggle line forms large circles sweeping through wide areas of blank space (or maybe the inner child is drawing on a collage, made up of other people's work). Let's go with the "squiggling on a collage" analogy. Sometimes the squiggles join together elements of different people's work into a chaotic pattern (this is especially true when those other worksare fairly similar to begin with), sometimes they erratically join disparate concepts, often inelegantly and the squiggle line moves on. I got a new toy earlier this year, and haven't had much chance to use it. 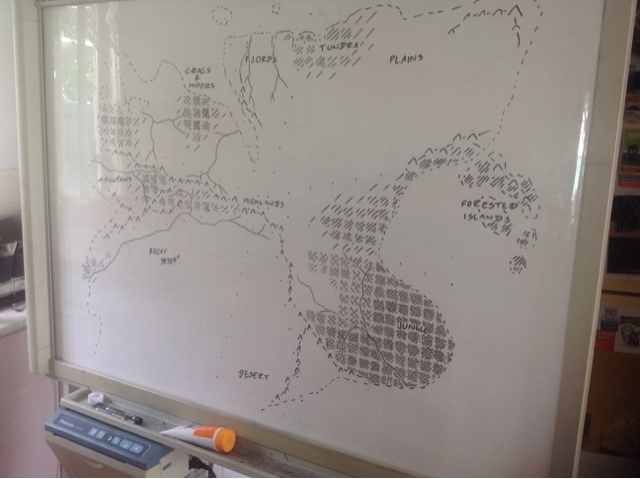 It's an electric whiteboard, where I can press a button to scan the image on the board to print it out, or send it to my computer. So, I'm going to use it for a new mapping tutorial series, since the last time I did this (back in 2013 and 2014) it seemed pretty popular. I'm starting with a map idea I'm working on for a new LARP. I already posted a map for the project, but I just don't like the way certain things have worked out on that version of the map. So I've reworked it a bit from the ground up and taken snapshots of the map development to show how I might develop a game world map from the ground up. The snapshots are reproduced here, one by one. There are faint yellow grid lines across the board that don't reproduce when the scanning process occurs, I've basically kept to this grid for the sake of simplicity. Step 1. Laying out what locations are where. Let's look at a few arbitrary systems where two players get 500 points to build their respective sides. First, a miniatures game. Player 1 picks a fairly balanced squad with a 100 point leader, four 50 point veteran offsiders, and eight 25 point regular troops...for a total squad of 13 troops. Player 2 picks a legendary 250 point hero, three 50 point veteran offsiders and four 25 point regular troops... For a total of 8 figures. The main differences between the teams are that Player 1 has 4 more troops to play with, while player 2 has a monstrous character on the table who is more than twice as strong as their opponent's leader. In a straight up battle, that 250 point miniature will probably be wiping the floor with everyone else on the table. This isn't even pushing the issue to the extreme of Player 3 who lays a single 500 point miniature (typically reserved for 2000pt army games) on the table. My thoughts on Apocalypse World and it's many clones and spin offs are mixed. On the one hand, I think they do some things in an elegant way that few games did before them. On the other hand, I think too many people are using those tools as a crutch that prevents them from doing anything truly innovative in recent years. There was a concept common on the convention circuit a few years back...actually, now that I think about it, it was a few decades back. Like many concepts, it didn't have a name when it was in vogue, and it was only when people stood back to analyse it that it was categorised with a title. It was generally called a "pieces of paper freeform", "paper-chase LARP", or some combination thereof. 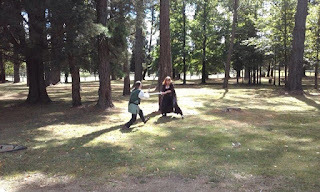 At it's heart, LARP is a social phenomenon. In certain varieties of LARP, people may beat each other up with padded sticks, in other forms of LARP they may dress up in elaborate costume, in some they may wear plain clothes and explore internalised concepts, but in almost every case the players interact with other players through words, body language, and all the social cues that occur in regular life. 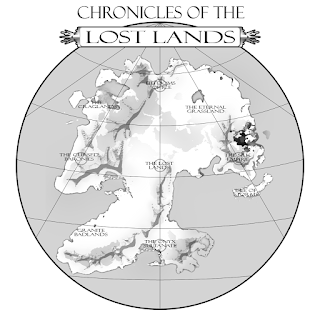 I just threw this together as an idea for the world of the LARP I've been discussing. I expect that there will be quite a few changes to the map before the whole thing is ready to go, but as a "proof of concept" indicating where the various nations of the world are, it does the job. Magic in LARP gets a bad reputation, which is hardly surprising because I've seen it done badly so many times over the past 25 years. 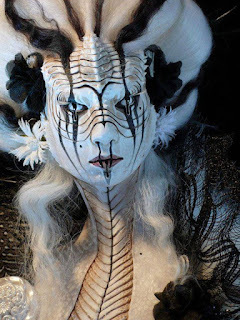 In parlour LARPs (the types that Sydney and Melbourne conventions called freeforms, much to the confusion of the rest of the world when we finally became connected by the web), magic was often ceremonial, dramatic and integral to the storyline. Fast casting may have happened through the revelation of an effect card to nearby players, but since games like this tended to be socially driven affairs where combat was frown upon in the narrative set up and every freeform tended to be written as a one-off event, there was nothing to compare it mechanically with anything else. Games like this didn't care about balance, in fact they'd actively flaunt it in many cases. The SCA hates being called a LARP. Full metal weapon re-enactors hate being told they need to pull their blows or need to react when someone throws "a coloured cloth pouch filled with birdseed" at them. ...and boffers boff. They enjoy that style of game for various reasons, some because they can let out their aggression with foam weapons, others because they want to show of their athleticism or combat skill. When asked to reign things in for the sake of other's enjoyment, I've often seen them storm off "because that's not the style of play they like". A bit like a magic player being asked to play with a "friendly" deck rather than their finely crafted "competitive" deck. So, we've got brand new players who've never LARPed before, some have never table-topped before. They watch pop culture, pseudo-historical, low fantasy, and high fantasy. They come to this stuff with no systemic baggage. It's almost a complete blank slate to work with. They've barely been introduced to mechanisms in play, things like counting your hit points. Things like losing your limbs if you've been struck in a fight. They've been made aware that things like magic can be replicated by spell balls being thrown. Forget race as an identifier. I'm thinking of using only culture and occupation as identifiers for characters. Using a whole lot of the ideas I've been playing with for tabletop games over the past few months, and liberally adding a dash of successful previous LARP mechanisms, combining with some ideas I've seen in other games recently, and making sure to avoid a few pitfalls where I'veseen some games go hideously wrong... I've basically ended up with a game system that should generally be self regulating in a LARP environment, is welcoming and not too overly complex for newcomers, but allows for some decent long term character development. Tonight I've started generating up some characters to use in the system, and I'm happy to say that it looks like it will work. A bit more testing to confirm it's sturdiness though. "An epic duel of long long cousins fighting over family honour." Yesterday I met up with a second cousin who I've never encountered before in person. So naturally we tried to beat each other to the ground with padded swords to determine who had the right to carry the family crest onto the battlefield. It probably wasn't fair that I've been at this game for a while, while this was her first time wielding a padded weapon. I'm working my way slowly through my most recent piece in the landscape series because I've run out of the heavy watercolour paper that I've been illustrating on. That means I'll have to focus on other projects until next pay day...if I can work a new pad into the budget...otherwise it may be over a fortnight until the following payday before I get the chance to buy some more. On the positive side, that means I'll have more time to work on some of the other artistic projects I've been procrastinating about. Or it might just mean I'll have to compile the images into the final card format that has been their goal, or maybe even work them into the book idea I've had. Or maybe just get stuck into the four university projects and assignments that I have to complete in the next month. Once again, too many ideas, not enough time. Things might get a little quiet around here for a while...but then again, contest season is just around the corner. There is currently a poll to determine the name of the Egyptian underworld scroll game I'm working on. Originally I was going with the name "Duat", but I decided to look at other underworld names, or words associated with the Egyptian underworld. 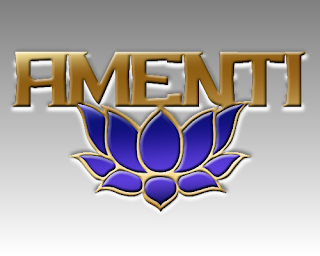 I encountered "Amenti" as an alternate underworld title, and "Maat" connected with the judgement of the soul. Between these and others, that gave too many choices and left me with option paralysis. ...or you could just add a comment here on the blog. As I write this, "Amenti" is in the lead. (I also considered using "Papyrus" as a font for this project, but thought that it wouldn't be fair even to use that font in a hipster ironic sense). I had created up a deck of cards for players to draw from as their characters sought to make their way toward the Fields of Aaru, but certain elements of the cards didn't quite feel right. I wasn't sure what was missing about them, or what was off, but something just didn't gel with the ideas I had for the wider game. I think this may have simply been due to too many component mechanisms, not knowing fully how they interacted with one another, but instinctively knowing that certain gears in the overall machine didn't mesh. Drawing out the map has helped. The core element of the scroll game, not surprisingly is the scroll. ...but note that this is not the final image, and the scroll will be styled to look far more like a piece of Egyptian antiquity. 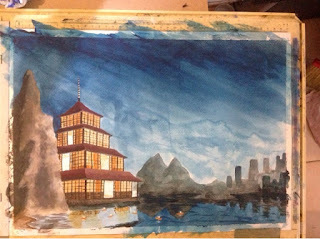 The point I'm trying to make here is the way the scroll is divided into 7 segments with 3 sections each. Scattered locations exist along the two sides of the river, and there are a few locations which are a bit more difficult to reach (marked with the white dots). As a reward for visiting these less accessible locations, a bonus treasure would be made available. At the beginning of the year I was toying with revisiting the concept of a game on a scroll. I looked at it first a few years ago, and in the meantime "Fall of Magic" has been released and has received all sorts of accolades. I've let it slide again, while I've been working on my series of paintings, but in the last couple of days I've been thinking about it again. A fairly simple game, where the players portray recently dead Egyptians in the ancient world...cooperatively trying to reach the Fields of Aaru by passing through a series of gates protected by the sentinels of the underworld, and trying to keep a step ahead of the hordes of Anubis. As players progress through the game their characters explore the events of their life, and the moments that might allow them to pass into the afterlife, or face oblivion. I'm thinking of running a contest where people design a game based on the landscape images I've been creating over the past couple of months. The idea would be to offer a fortnight to produce a game of no more than 4 pages (let's say 1500 words); everyone who enters would recieve a compiled pdf containing the full range of games, the winners (one by popular vote, and one being the game I like the best) would recieve a printed copy of the full set, with colour images from the series scattered through the book. For the moment, I'm just gauging interest. Why don't I like them? Why do I think they are lazy game design? Why do I think it was a good idea that we generally as a hobby moved beyond them in the 90s? Why do I think it's hideous recursionism and conservatism in spite of progress to use them? The Seven Ages of Magic just came to my attention, and it really fits well with a lot of things I've been recently thinking about. I love the idea that magic flows through a world in cycles, my wife has been trying to get me to read the Wheel of Time books for over 13 years now (and I had friends who were fanatical about the series before that), I've never actually read them but I get the feeling that this is a common theme through the books. One thing that I really like about the cosmology of this cycle is the way different forms of magic might be waxing or waning at different points of the cycle within the same world. I look specifically at the World of Darkness examples that are indicated (Wraith, Vampire, Mage, Changeling, Werewolf), each e ists at a different point because that's what those games are about. But when you look at them as a whole, magic isn't necessarily dying, its just in a state of transformation. So, I'm thinking about cards again. But there are numerous ways in which cards can be incorporated into a game design. The simplest option for using cards in a game is probably substituting them dor the dice as a variant form of randomiser. Standard playing cards are great for this, because they add extra degrees of information that might be quickly used to add flavour to result outcomes using suits and ranks. Tarot cards might be even more useful because you gain access to major and minor arcana, interpretations of cards in upright and reversed configurations, as well as thesuit and rank values. Then you could always play with the option of developing your own custom deck to specifically explore the thematic content of your world, but this is probably the most time consuming option. A few designers have experimented with the concept of using a deck of cards to describe a character. Where different cards might be used to reflect different things that had been learnt along a character's journey, perhaps exhausted (or flipped-over) when they are used, perhaps drawing a hand of cards as the abilities that a character might see as potential strategies in the current situation, or maybe using the complete deck to simulate hit points (with the deck gradually eaten away as damage is taken). At what time do you say a game is in need of CPR, at what stage do you call it dead? I'm annoyed that recent politics have seen the death of the game I've taken over. It hasn't helped that a bunch of old players have broken away to found their own games because they were disgruntled by one or two minor aspects of play, or because they didn't like some person or another. 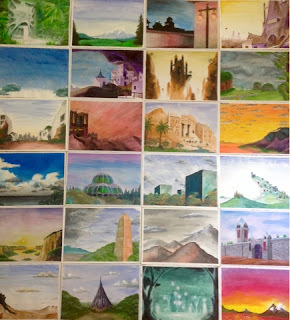 If you're connected to me on any form of social media, you'll know that I'm working on a series of fantasy landscape images. I'm up to about 25 or so at this stage, and they'll be made available soon. For the moment though, a break in the monotony with some other inspirations. Perhaps the kinds of characters who might be found in those landscapes, or maybe the denizens of the Darkhive setting that I described last year. ...well, it's time to get excited again. I've just been interviewed by +Tony Simpson who runs the website 'LARP Out Loud', which is unsurprisingly about spreading the love of LARP as far as possible. For those who are interested, the interview can be found here. I'm actually pretty excited about this project as a way of telling a different type of story in a LARP context. The only problem I'm seeing at this stage is the fact that I probably need a dozen players to make sure my plans work...and at this stage, there are six players who've said they're coming along. Wow. Who'd have thought resharing a simple article about gender issues in Games Workshop products would generate so much discussion. Here's where I did it. There is so much that could be expanded in this discussion, so many issues bottled up inside, so much confusion. If you want to discuss it here, or have a metadiscussion and the core discussion here, please do. Otherwise feel free to delve into the original post and it's comments. I might come back to this topic later, it seems to link in with some useful stuff I've been studying at University. 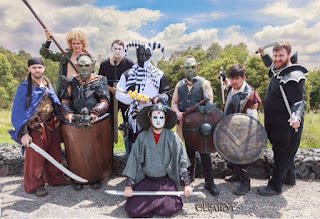 One of our local LARP regulars is wanting to start up a new LARP based far closer to where I live (in the southern highlands of NSW, Australia). There seems to be a bit of interest from a few roleplayers, re-enactors and LARPers from existing groups, so we'll see how things pan out over the next few months. The existing LARP has been undergoing political issues that have seen numbers dwindle in recent months, as well as being besieged by several other LARP groups that have opened up on it's doorstep. It might be nice to get into something new without a whole lot of baggage from previous organisers, and sabotage from other organisers who have been wanting to usurp the game ever since they showed up.